On the first day of Christmas, your true love - or someone - sent to you. . . a Holiday Ornament designed just for writers. In the interest of disclosure, this Christmas Ornament For Writers is designed by me and sold in The Write Way, my Cafe Press shop. $101.00 to Sky's The Limit - Wow! Someone really loves you! Sales of this porcelain ornament usually don't start until December, but this year, orders were being placed in early November. This is a perennial favorite in The Write Way where you'll find T-shirts, coffee mugs, journals, and more designed by a writer (me) for writers. Each item was created to please writers and to be used to promote their writing and their careers. 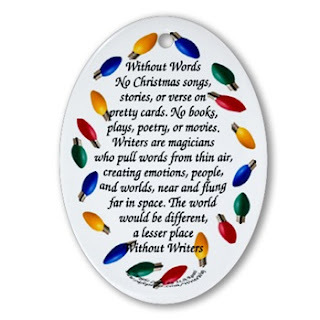 Writers need a Christmas ornament that celebrates their gift to the world. This porcelain oval is perfect! Get one for yourself and one for a friend! Handmade oval ornament of high quality porcelain. It measures 2.3" x 3.25" with red ribbon included for hanging. Be proud of what you do. Love what you do. Celebrate your contribution of words.